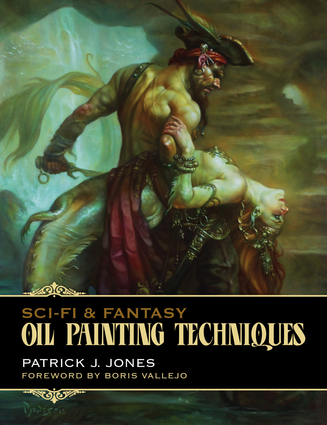 The secrets of painting Conan, mermaids, and otherworldly creatures, from pencil sketches to finished art An award winning sci-fi and fantasy illustrator offers a masterclass in creating fantastic art in the spirit of Frank Frazetta and Boris Vallejo. No serious student of sci-fi and fantasy art or oil painting techniques can afford to miss this book with its sharp, unique insights from a true master of the genre. It includes step-by-step stages, plus advice along the way for every aspiring oil painter, illustrator, and gallery artist following their dreams. Patrick Jones is an award winning science fiction and fantasy artist and teacher. His work is collected and published worldwide and his client list includes companies such as Disney, Lucasfilm, and Roc books. Boris Vallejo is an iconic science fiction and fantasy artist whose incredible oil paintings appeared on the covers of magazines such as Eerie, Creepy, and The Savage Sword of Conan, inspiring a whole generation of young artists. He has produced decades worth of fantasy art and is admired the world over as one of the all-time greats of the genre. He lives in Allentown, Pennsylvania.